Do I need a footing? Building a 18' by 12' concrete patio, with a cover...will I have to put a footing down? The footing depends on the type of cover. Most likely you want to anchor the cover to the slab. Option 1. 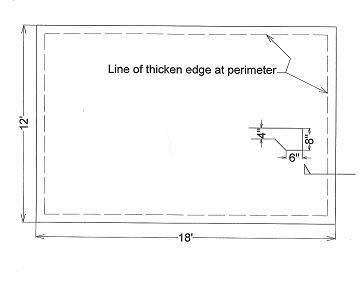 Pour your patio with thicken edges similar to the sketch below. This will allow you to drill anchors into your slab to support the cover. The thicker edges will give you better options for type of anchors. Option 2: Dig footings for the post. If the cover has posts, make their locations thicker. For posts that are permanently anchored to the slab, make the footings deeper i.e. 8"x8"x12" (eight inches square, 12 inches deep). This will provide extra bending resistance for wind load. Your main concern is the wind load. The slab will provide a nice anchor but you need to make sure your slab won't crack due to the lifting and twisting effects of the wind.